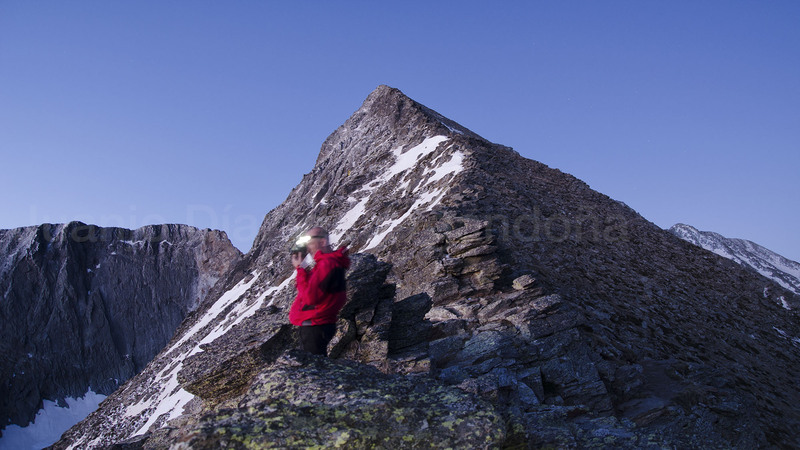 We all have been in the summit of some mountain and tried to find distant objects while wondering what I am looking at? Trying to discover what is beyond the Horizon has been related to human development through all the History, allowing us to step into new worlds and to widen our knowledge of geographics and physics. It has been key as well to discover the highest peaks in this world. But there is a question as important as the previous one: How far can I see? Pic du Canigó is well known in mountaineering circles as it is the last high peak before the Pyrenees descend to an end in the Mediterranean sea. Its elevation of 2.784 meters above sea level and its great prominence with surrounding areas make it an special mountain. 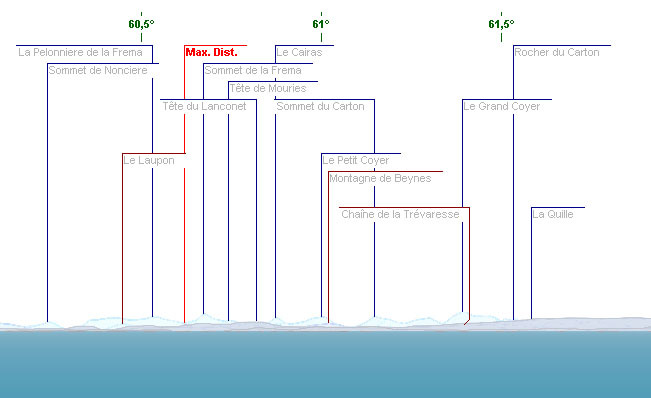 Actually, some of the ways to the top are included into the longest of all Pyrenees range, shorted by vertical distance. With valleys down to 650 meters, there are more than 2.000 meters to be covered before touching the summit. This prominence, together with the great challenge needed to conquer it, had made Pic du Canigó a mountain to look at, being the center of multiple events from Catalan people of both sides all over the year. One of the most important ones occur on 24th of June. What maybe some people didn’t know, until now, is that its summit hides one of the greatest views in Europe, and it becomes even better when you discover that it is not happening all the time, but just a couple of days though the year. And this will only happen, of course, if the weather allows it. 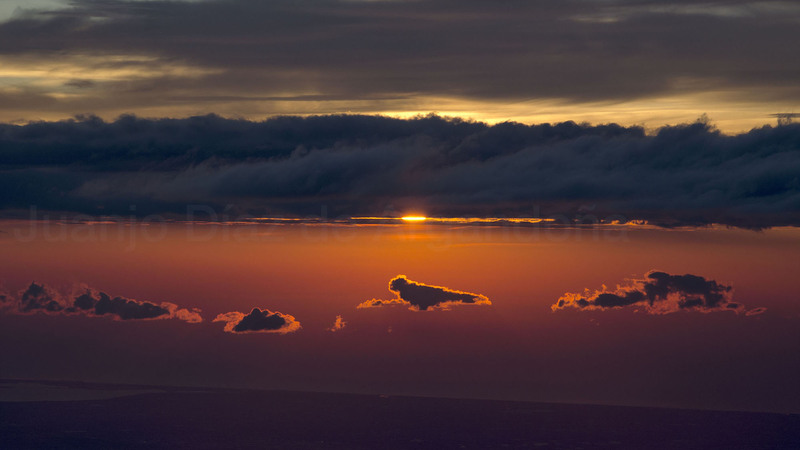 We knew the Alps were in a direct line of sight from the summit of Pic du Canigó for a long time, since we discovered some amazing horizon simulators available on the web, allowing us to wonder how that visions would be and, of course, trying to find the longest one. Barre des Ecrins 412 km. Sommet de la Frema 388 km. Tête de l’Estrop 382 km. Trying to cover more than 300 kilometers in a single picture, in daylight, is almost impossible unless the conditions become really good, something that roughly happens 2 or 3 days in a year. With the logistics needed for going to Pic du Canigó summit, it means a huge ammount of luck and a high probabilty of not achieving it. So we needed something else to helps us achieve this pictures, and we knew at that point some of these lines of sight were greater than the -then- longest one: 361 kilometers to Mount McKinely in Alaska. This added some extra interest in researching the availability of this sights. This investigation changed into a pausible plan when Mark Bret, one of the members of our group, discovered this range of peaks were in direct intersection with the rising sun some days near summer solstice. 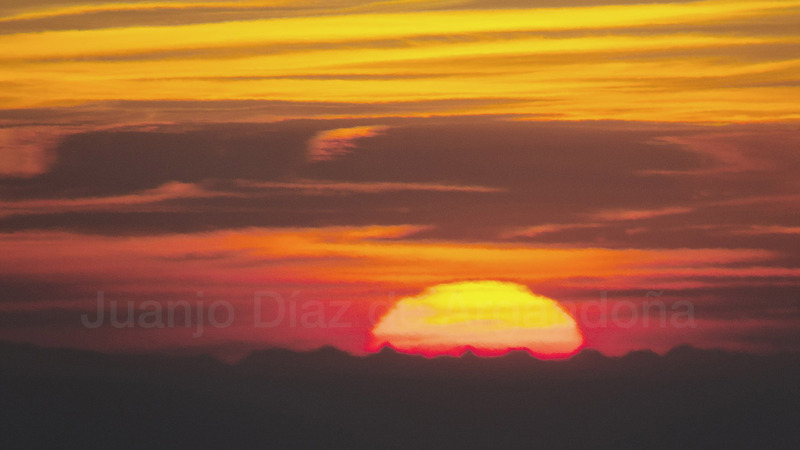 Pic du Canigó – 13, July 2014 – 06:00 a.m. It was where (and when) we had to be to see the sun rising from behind the Alps, the most likely way to success in portraying them: a perfect aligment. The Sun, the Alpes-de-Haute-Provence and us in the top of Pic du Canigó. As it is called in astronomy terms: a (perfect) syzygy. The adventure was not easy to execute, as we were stepping in to the unknown, only trusting in our simulations. We had a great hope in our preparation and planning, and before sunrise we were there. The sun rose, the Alps appeared: we had the picture and the Record in our hands. This event attracted the attention of the media as early as we revealed it to the world. Hopefully some mountaineers read it on the newspapers or listen to the story in the radio and decided to do something similar. Anyway we felt the target was achieved but the picture lack some mysticism, that was not the image someone imagines when trying to figure out how the Alps might look with the sun behind. We needed to try it again, further. The target was still the same, but instead of trying it on July, we planned it for May. Earlier so the air conditions will likely be better. And in case of failure there is another opportunity in July we can use. We were not there in 2014 just for the picture, we were there to learn how this events are in real life and to test and improve our ways of predicting this situations. This time we had not a date and a place, but a series of possible timings for another series of candidate peaks. To do this in May means you don’t have the ease of access that this peak has in mid-summer, when a contryroad takes you to almost 2.000 meters high. It means to climb the mountain from its base. It means to get really exausted, it means to continuosly think about walking one more meter. But it also means that this achievement will become the greatest reward ever. Finally, on May 16th we were starting to walk along a 2.000 meters trekking toward the Summit of Pic du Canigo, splitted into 2 1.000 meters sections, with an small stopover to get some sleep. It was just 3:00 am when we got up on May 17th to start walking and be on the Summit by 6:00 am. Walking at night thru the forest at 2.500 meters above sea level is an incredible experience, greatened by the amazing views be had at that moment of cities along the Mediterranean coast and the dimmed light of the most distant ones covering smalls parts of the horizon. Last meters were more like a running competition than a trekking journey because the sun was starting to illuminate the background and that meant we had no more than 10 minutes left for the moment to happen. 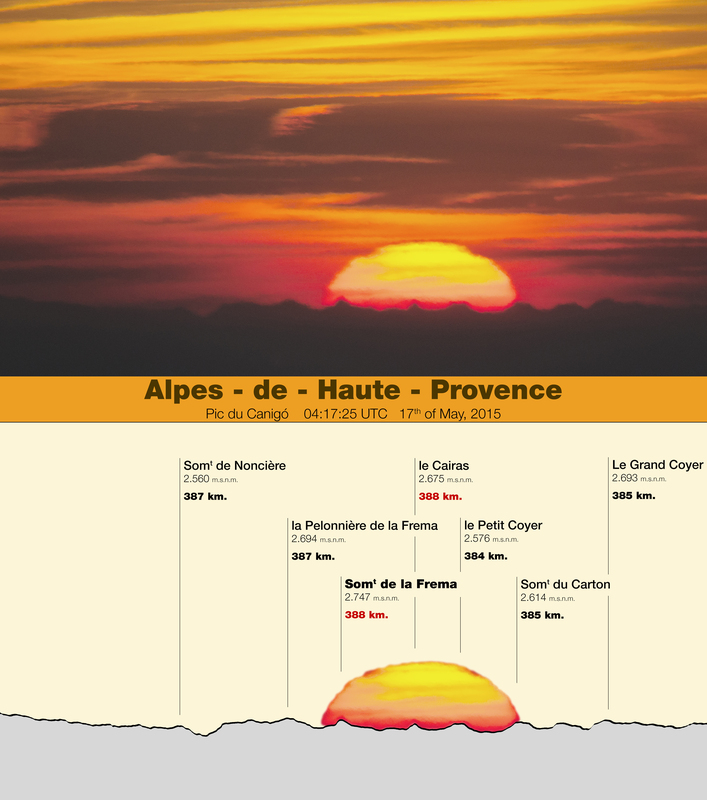 We run along the last ridge on Canigou and at the exact time we predicted it the Alps appeared on the horizon. It was like a year ago. This time, farther and better. It was a moment that stopped time. First lights illuminating the Alps on the horizon. < Previous Cantavieja – Vignemale | 254 km. Next > Bieszczady – Łomnica | 183 km. Great reward for such a challenging combination of prediction, technique and…sport! Sure you keep the intentional hook on this. Congrats to the group!